Selsey boss Daren Pearce was pleased with his side’s performance despite the 2-0 home defeat to Southwick in their SCFL division-one opener. The Blues had chances to get something from the game, which included a missed penalty, as Southwick took the points. This was the former Sidlesham manager’s first competitive game in charge of Selsey and will look to build on what the players have learnt during pre-season. The visitors opened the scoring in the 20th minute as Liam Reyland slotted the ball past Selsey’s No1 Connor Kelly. Selsey’s Calum Britton had a great opportunity to level the score but his penalty was saved by the visitors goalkeeper Ashley Davy. 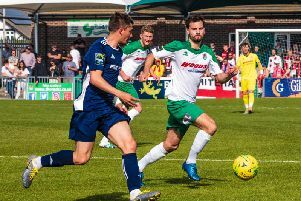 As the hosts tried to find a late equaliser, Southwick doubled their lead with ten minutes to go as they counter-attacked and the away side’s Jamie McKenzie netted. Pearce said: “I’m obviously disappointed because the lads did well and tried to carry out everything we asked them to do so it is always disappointing to lose, especially your first game. “We created plenty of chances but we’ve just got to be more ruthless in front of goal, and Southwick were really organised but I think on the day, we more than matched them, and missed chances cost us. “I think we deserved something out. If the players learn from it, which I’m sure they will that’s the main thing. It’s a good learning experience for them. Selsey will look to bounce back from the defeat as they host Billingshurst in the Peter Bentley Challenge Cup on Saturday. Selsey: C Kelly, Atkinson, T Kelly, Hambleton, Higgins-Pearce, Clarke, Dowdell, Gregory, Hall, Britton, Morey. Subs: Buckland, Bush.